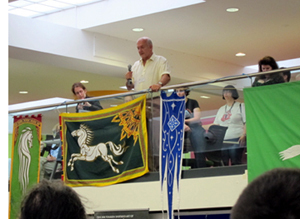 This afternoon the “Return of the Ring” event, held by the Tolkien Society at the University of Loughborough from 16 to 20 August, ended. In programming it, the organizers sought to bring together academic studies of “the Professor,” fan activities, and figures from entertainment—the latter being represented by Brian Sibley and others active in various adaptations of Tolkien’s work. With as many as seven separate panels and activities competing with each other in some time slots, there was something for all interests and some tough decisions about which ones to attend. My own inclinations being more toward the academic, I can report more on the lectures and panels than on the Masquerade or the classes on Tengwar, costuming, and other skills appropriate to Middle-earth and its fans. Even there I can only mention the highlights briefly. That said, even I couldn’t miss one group of guests: the French team La Compagnie du Dragon Vert (The Company of the Green Dragon). 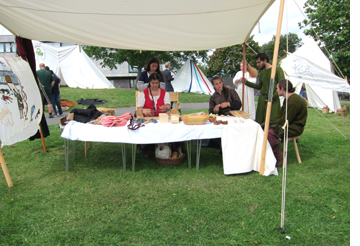 These young people, dedicated to reviving the crafts, costumes, and way of life of the Medieval era, pitched their white tents right outside one of the two main buildings in which the event was being held. Each day they gave demonstrations of archery, cookery, sword-fighting, arms and armor, and music. The photo shows an area devoted to embroidery and making wax candles. My own paper was scheduled for the first afternoon (Thursday, August 16). 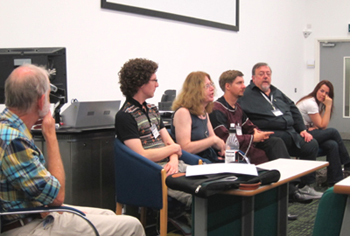 The panel led off with a talk by Martin Barker, known to many TORn readers as the director of the “Lord of the Rings Audience Research Project” back in 2003-2004. He presented an interesting survey of the lingering ways in which Gollum has been referenced in public discourse in the years since the Peter Jackson film came out. I spoke about anachronisms in The Hobbit and The Lord of the Rings, discussing how The Shire contains many objects and references appropriate to a rural region in the late Victorian era. Immediately after our session ended, the opening ceremony was held in a large open atrium where the impressive art show was set up (featuring works by Cor Blok, Ted Nasmith, Ruth Lacon, and others). This area also contained vendors selling books, jewelry, costumes, and all sorts of items relating to the film. During the ceremony, some of the prominent scholars present, including Tom Shippey (right), made brief statements from an upper story opening out onto the room. 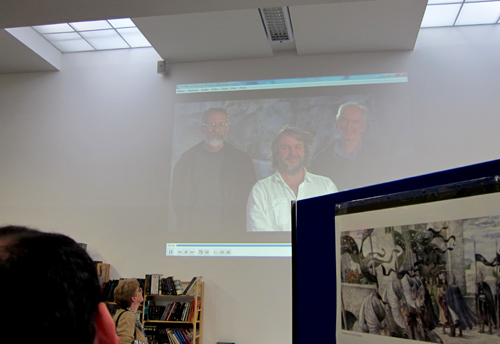 A completely unexpected treat was a video message from Peter Jackson, John Howe, and Alan Lee, projected on a wall and greeted with enthusiasm (see top). No photographs were allowed in the art exhibition/vending area itself. 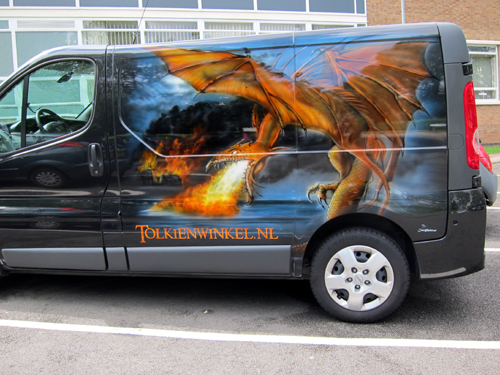 Still, the van of René van Rossenberg, of the Tolkien Shop/Tolkienvinkel, was proudly sitting in the park lot outside, providing spectacular visual evidence of the activities inside (see bottom). Friday morning began with a heavily illustrated triple lecture by Bob Blackham on “Tolkien’s Birmingham,” “Tolkien’s Oxford,” and Tolkien: The War Years.” These were lively summaries of Blackham’s books on these same subjects: The Roots of Tolkien’s Middle Earth, Tolkien and the Peril of War, and Tolkien’s Oxford. An avid collector of old postcards and photographs, Blackham brought to life the era of Tolkien’s youth and showed photographs of those locations that still survive. I also particularly enjoyed Christopher Kreuzer’s lecture on “Colours in Tolkien,” an extensive look at color motifs and terms. 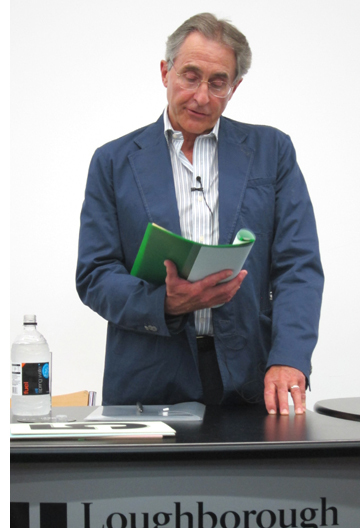 After lunch Charlie Ross presented his “One Man Lord of the Rings” to a packed house and loud applause. Other highlights of a packed day included a talk by Cor Blok, the artist whose work has graced the past two Tolkien calendars, as well as a book, A Tolkien Tapestry. Tolkien himself bought two of Blok’s paintings. It was a treat to see some of the originals in the exhibition, since they involve paint on textured paper. Tom Shippey spoke immediately after Blok, charming the audience as always with his humorous discussion of types of leadership in the Legendarium. Saturday was also busy. With all the recent emphasis on decline and death in the Legendarium, it was pleasant to see a panel called “Tolkien and Fun.” In “The Significance and Place of Laughter in the Writings of J. R. R. Tolkien,” Charles Bressler took a quantitative approach, counting the number of times various characters and races are described as laughing. Maureen Mann looked at “Tolkien and Nonsense,” analyzing his use of the term “nonsense” and offering examples from Farmer Giles of Ham and other major work. A panel on adaptations brought together the makers of three fan films: Kate Madison, director of Born of Hope; Chris Bouchard, making of The Hunt for Gollum, and Michal Kára of the Czech Republic, whose short “music video,” Niënor Níniel, was shown during the panel. They were joined by Constance G. Wagner, who worked on the London version of the stage musical of The Lord of the Rings, and Brian Sibley. Among the revelations was the fact that Madison and Bouchard both were sent warnings by Saul Zaentz’s Tolkien Enterprises (renamed Middle-earth Enterprises in 2010) and ended up signing agreements that allowed them to continue but forbade them to make further fanfilms based on Tolkien! Michael Tolkien, grandson of J. R. R. Tolkien, presented a talk on “Fantasy: delusion of wisdom?” He discussed his grandfather’s “On Fairy Stories” and illustrated it by readings from one of his own verse fantasies. The Tolkien family resemblance was obvious, and Michael was gracious in answering questions from the audience (including mine). Late the same afternoon Verlyn Flieger, author of Splintered Light and other familiar titles, lectured on French influences on Tolkien. She began by taking Humphrey Carter to task for claiming that Tolkien was Gallo-phobic and proceeded with her usual thoroughness and clarity to show that dislike does not preclude influence. She pointed to the use of the term “aventure” in “On Fairy Stories” and declared that The Hobbit belongs to the tradition of French Romances. Sunday I opted for a coach tour of Oxford, since I had never seen any of the Tolkien-related places there, despite several visits to the city. The drive down and back was long enough to prevent us from stopping anywhere long. 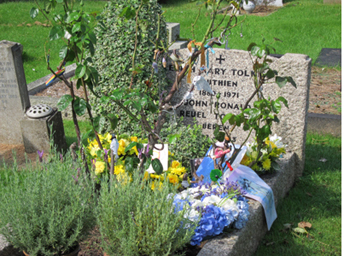 There was, however, a brief but moving visit to J. R. R. and Edith Tolkien’s grave, with a wreath-laying (below left) and singing of “Namárië.” We drove past the Tolkien residence. A walking tour of the university are took us past Exeter College, where Tolkien was an undergraduate, and on toward the Cherwell to see the Examination Schools and Merton College. A lunch at the Eagle & Child (“Bird & Baby”) pub, where the Inklings famously met, rounded out the short visit. We were back in time for the 5:00 lectures. I opted for Benjamin Barootes’ “These Fading Days: Language, Loss, and Recovery in Tolkien’s Legendarium,” which was the “Christine Davidson Memorial Lecture.” It dealt with the waning power of language in the Legendarium, with an ingenious interpretation of Aragorn’s short coronation speech as a renewal of language’s force as the Third Age ends. The closing ceremony saw much well-deserved praise and awards heaped upon the many volunteer organizers of the event. The Tolkien Society runs its annual Oxonmoot meeting, but larger events like “Return of the Ring” are scheduled only in special years—in this case, of course, the 75th anniversary of the publication of The Hobbit. Many attendees, who toasted “The Professor” repeatedly in the course of the event, will be looking forward to the next occasion for such a celebration.